Refreshed website design for this open air museum in Norfolk, England. 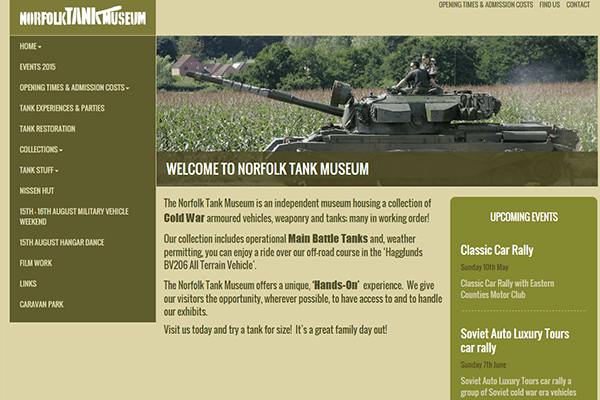 Norfolk Tank Museum approached Peacock Carter to redesign and rebuild their existing WordPress website to help them appeal to more visitors. As WordPress experts, we advised on improving the structure of the vast amount of information about the museum’s collections available online, as well as providing a full visual overhaul of the website. Our redesigned website for the museum focused heavily around providing a more comprehensive brand for the museum, as well as greatly improving the experience for visitors using their mobile or tablet devices to view the website. Information for visitors about facilities, opening hours, entry costs and upcoming events are featured heavily on the new website, as are details on corporate events which help to fund the museum further. The new responsive WordPress design for the website allows the museum to concentrate on managing the website’s content, leaving them more time to maintain and restore their collection.